The New Pioneer is your guide to everything the land has to offer. Every issue is packed with useful how-to information for back-to-the-landers, plus spotlight pieces on couples and families that have actually “been there, and done that” with success! 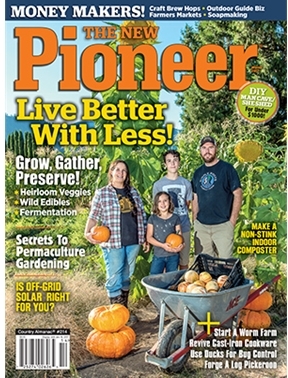 The New Pioneer is also chock full of expert advice on must-have tools and homestead gear, planting and farming, strategies for achieving energy independence and buying rural land, do-it-yourself projects and how to get the most out of living the rural life.